Now that I’ve been successful in printing strings in whole and character by character, I thought the next logical step would be to get a string from the user. This post deals specifically with that. I use the CIO routine Get Record ($05) to accomplish it. I also introduce a new instruction. Let’s get to it. DEY – DEcrement the Y register. This reduces the value in the Y register by 1. As usual I am only going to document what is different. Lines 310 to 390: Clear the screen, print the ruler, print the input prompt “Name? “. Lines 430 to 450: Load the Accumulator and X register with the high and low bytes of the input string address, then call the input subroutine identified by label INPSTR. 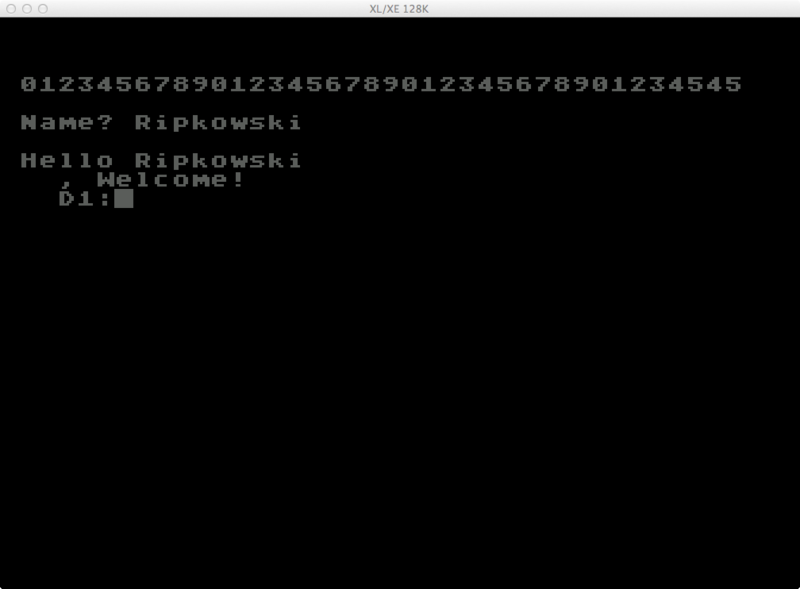 Lines 460 to 570: Print the “Hello ” message, followed by the input string, followed by “, Welcome!”. Lines 5000 to 5140: The print string routine that prints character by character rather than the whole string as previously written about. Lines 6000 to 6030: The cursor positioning routine as previously written about. Line 7005: Start of the input string sub routine, labelled with INPSTR. Line 7015 to 7020: Store the string address high and lowe bytes into ICBAL and ICBAH (the IOCB string address). Line 7052: Load the X register with 0 to reflect IOCB 0. 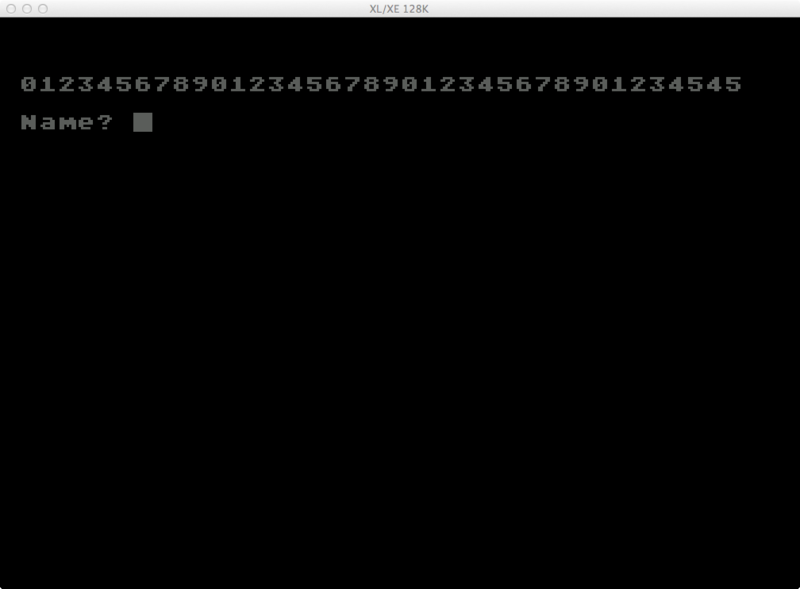 Line 7055: Load the Accumulator with 5, the IOCB command for get record. Line 7060: Store the Accumulator in the IOCB’s command address. Line 7072: Load the Accumulator with 30. This is the maximum number of characters that will be accepted. Line 7080: Store the Accumulator in the IOCB’s buffer length low byte address (ICBLL). Line 7085: Load the Accumulator with 0. This only needs to be defined if the maximum string length is greater than 255. Line 7090: Store the Accumulator in the IOCB’s buffer length high byte address (ICBLH). Line 7110: Call the CIO routine to get the input. Line 7160: Return from the subroutine. Line 10050: This is the input string address. Reserving 30 bytes. Line 10060: This is the print character index. Reserving 1 byte. I moved it from the beginning of the code to the end. Since this is not desirable I had to revise the input routine slightly. After the input call, I load the Y register with the value in ICBLL, which is the number of characters actually input. Because the count includes the Return key, I decrement the value, then store and EOS (0) at the string address offset by the Y register value. This is a pointer operation so I needed another 2 bytes in page zero to store the address. I chose $CD. In the above listing, the highlighted lines reflect updates to the first source code listing. Line 21: Sets the location for the INput String PoinTeR labelled as INSPTR to page zero address $CD. Line 7035 to 7040: Store the string address in the pointer location INSPTR. Line 7120: Load the Y register with the value in ICBLL. ICBLL holds the actual number of characters input after the CIO call completes. Line 7135: Decrement the Y register. The number of characters input includes the return key which I don’t want. Line 7145: Load the Accumulator with EOS (0). Line 7150: Store the value in the Accumulator in the input string address offset by the Y register. This will be the location of the Return (EOL / $9B). This basically turns the EOL into EOS. It uses indirect indexed addressing to get the actual string address stored in the location referenced (a pointer). After assembling the program with the changes above, running it produces the correct results.